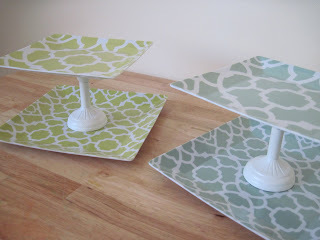 You will need 2 sets of plates, white spray paint, and two candlesticks from the dollar tree. 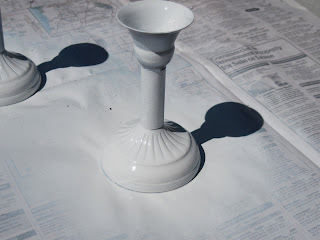 Spray paint the candlesticks with 2-3 coats of spray paint and let dry. Seal if desired. Do not do this as close to your family van as I did. Praise God it is white. This is what the candlestick looks like when finished. 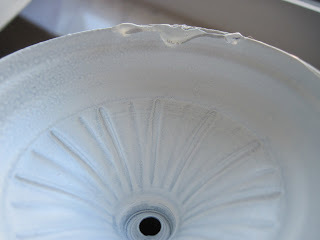 I used hot glue but Jen at Tatertots and Jello used gorilla glue in her tutorial which I think is a great idea too. I just did not have it and I of course waited until Monday afternoon to work on both tips for this Tuesday. 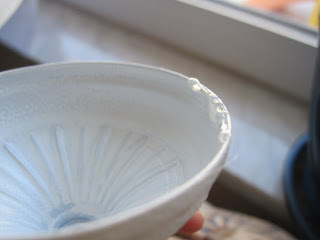 I made sure to coat the edge with hot glue and let the drips fall to the inside. I centered it on the bigger plate for the bottom tier and then centered the smaller plate for the top. Sunday, I had an opportunity to walk to the library while the girls napped. My intention was just to browse books and magazines and hang out. I started reading some back issues of Country Living magazine (May 2009) and I came across this awesome tip in their Idea Notebook section. 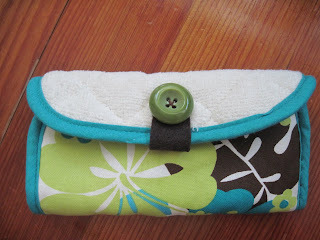 Turn a potholder into an eyeglasses case! How smart! And being a 4-eyes since the age of 6 that I am and unable to see the Big E on the chart without them, I was intrigued. I need to take care of my glasses because without them I am LEGALLY BLIND! Seriously. STYLE ONE (the above picture) is just the kind you slide in with an opening at the top. 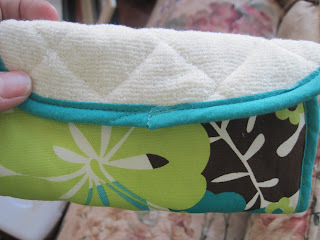 I started by turning the pot holder over to the back lying horizontally. 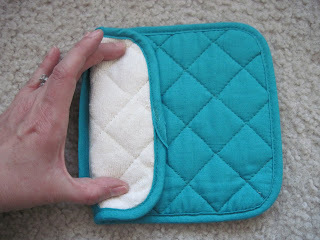 I first folded in the terry cloth, pocket portion towards the center. Then I folded the printed side back towards the center. I stitched the bottom closed and up the one side leaving the top open for the glasses to slide into. No, I do not use a sewing machine. The last time we got together, we had words, said some things we did not mean, objects may have been thrown across the room. It was not pretty. And that was before I threaded it. 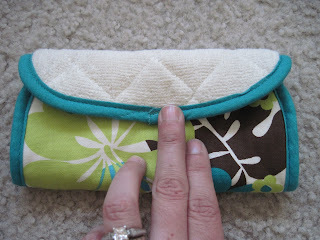 But this project is so easy with or without a sewing machine. (Just looks nicer with one of those mean old things). STYLE TWO is more of a clutch style. This one was my little spin on the basic case. Fold the print side up first. 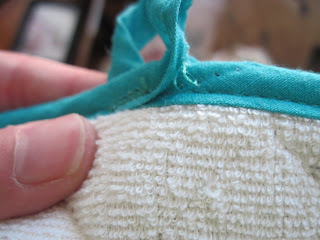 Stitch up the side on the seam of both sides. I used brown thread because I ran out of the pretty tealish color. Grrrr. 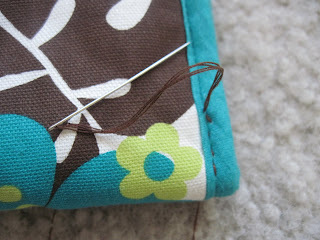 When you are done sewing the sides, fold down the top and it should look like this. 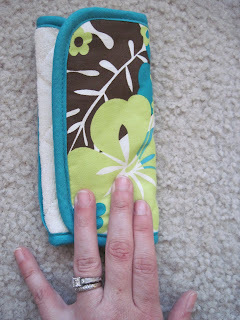 I took the pot holder loop off using a seam ripper. I carefully cut it off as close as I could to the edge. 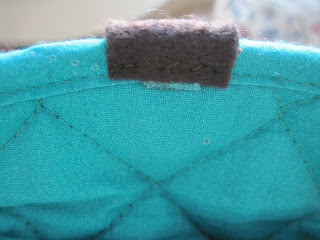 To cover it up, I stitched brown felt on the inside edge over to the top. I plan on attaching a Velcro closure but never got the chance because I had a class to get to. Sorry for waiting until the last minute. 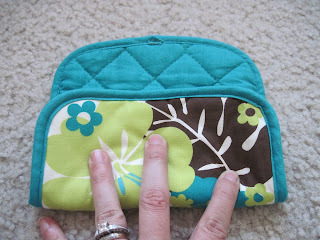 The best part about this little clutch case is that you can use it for anything. Throw some make-up in there, coupons, whatever. And shhhhh. Who would know it was a pot holder? I am from Russia and in Russia exist opinion American women don't able make things by hand. But after your handsome bag I have changed my opinion! Last minute works for you because these were awesome tips!!! My sewing machine and I had a fall out, too. And I guess I complained about it loud enough, because I got a new one for Christmas! It's rather loud, but it can sew through just about anything! 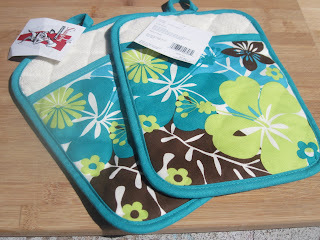 My bags for the art auction aren't out of place mats, but I'll make one soon and post pics! OMGEEE I love it!!! great tips!!! Thanks so much for the two tips I look forward to them!!! Oh my goodness! I love your two ideas! I am seriously going to stop by the dollar store and target on the way home so I can try these out!! Thank you so much for sharing! I hope you have a beautiful and blessed day! wow wow wow!!!! i LOVE these tips!!! I want to grab your two tips tuesday button for all my friend to come visit!!!! I am going to try the stacked plates for my baby's birthday party treat tray!!! you are awesome thanks for sharing!!! Seriously!? These projects are both AMAZING! I shared the link on my craft forum so that my friends can come check it out too, i love these! Great ideas and thank you so much for the tutorials! ha! 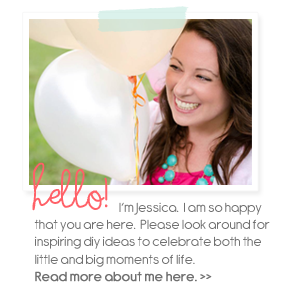 Jessica you are my friendly neighbor down the street with your own, (paid for) pastel cottage. You may have kids in your dream world, but not in mine sistah! since your cottage is paid for you also have the money to come to my shop and buy a Lollibag everyday, oh wait no you sometimes work in my shop for me, so you get one free :) Ok I'm taking this way to seriously, I"m staring at my computer screen, not wanting to snap back to real life.. I was so excited when I saw this post. I have made the cake stands before using vintage plates and vintage glass candlesticks. See, I am crafty and nit just in a sneaky, evil way. BTW....I have been praying for you on your house hunt. Keep me posted! 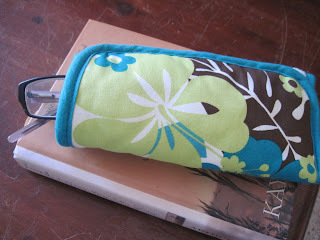 This is my first tme reading your blog, I found you through Craft Gossip. I really enjoyed it. Not only are you creative but you are very funny too. But how do you do it? Coming up with 2 tips every Tuesday? You are officially amazing!!! Hope you house hunt is going better! Both are soooooo cute! Amazing! That is JUST BRILLIANT!!! I LOVE SIMPLE YET what a terrific finish!!! Looks so professional! 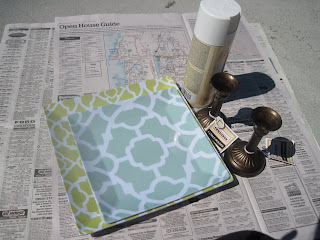 I featured your awesome plate stand in my "Tutorial Tuesday" post today featuring my favorite DIY projects. Thanks for the awesome tutorial! I just found this but, I want to thank you for sharing it! 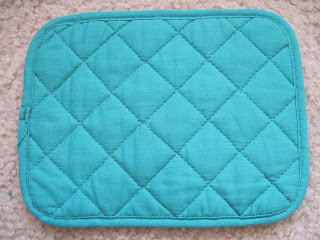 I find some of the prettiest potholders sometimes and wish there was something else I could do with them. I never thought of this! Brilliant!!! 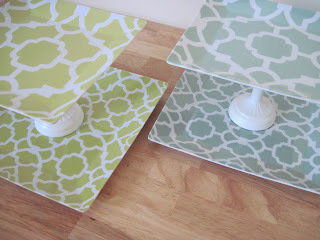 I just recently discovered your Two Tier Plate Stand project as well as your blog via Pinterest. Have you seen any of these two size/same design melamine plates lately? 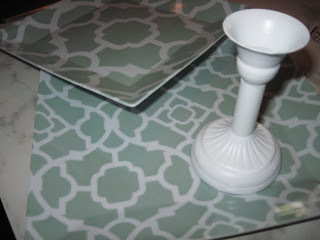 I'd love to make this project but haven't been able to find plates that I like. Thanks for any suggestions!! :) Now you have me wanting to update mine! Blessings my friend! Why wouldn't you just add the button to the bottom and use the loop as a button hole closure? I think I will try it this way. This is going to make getting old and needing glasses for the first time that much better! Thanks so much for the idea! !